Our new hemp extract is crafted with care by Bluebird Botanicals, a company that shares our commitment to quality. The first hemp company to have certified GMP (cGMP) hemp extract. 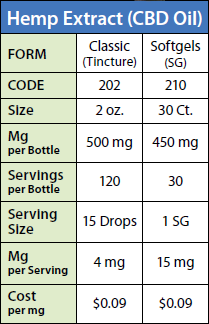 Each softgel contains 15 mg cannabidiol. Also available in 2 oz tincture. Other Ingredients: Softgels (purified water, gelatin, glycerin). Manufactured with only legal hemp. Suggested Use: As a dietary supplement, take one or more softgels by mouth, twice per day, or as directed by your health care professional.